Predict the full time scores, and first team to score of selected Premier League matches this festive season (Xmas & New Year fixtures) and win up to ₦50,000!!! 1). Premier League, Matchday 19 , on Dec 23rd. 2). Premier League, Matchday 20, on Dec 26th. 4) Premier League, Matchday 22, Premier League on January 1st, 2018. 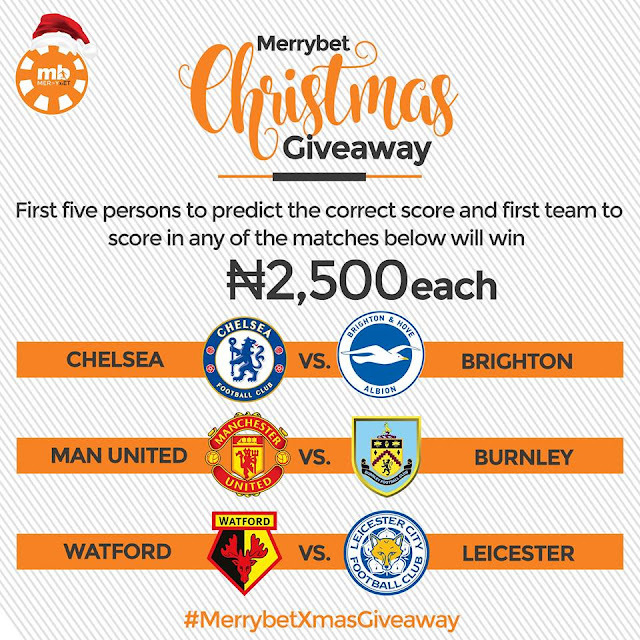 -The fastest 5 correct answers to get the predictions right get to win N2,500 each. -We had five (5) lucky winners from Matchday 1, therefore, ₦2,500 is available for 5 lucky winners for Matchday 2. -If there is no winner for the second week, the prize gets doubled to ₦5,000 each for the first 5 correct winners for Match day 3, and it also gets doubled to ₦10,000 if there are no winners for the ₦5,000 week (Matchday 2). -Participant must have a Merrybet account, Like our Facebook Page, Merrybet Gold, Follow us on Twitter @merrybetgold, & Instagram @merrybetsports, like, comment, and re-post the promo post. -Please note, participants are to predict just one game out of the three matches on the promo post. Entries who have more than one prediction under the promo post will be regarded as invalid. The promo will run from Thursday, December 21st to January 1st 2018. i.e the next four (4) different Premier League Match days, exclusively for our Facebook page.